One of the great thinkers of our time, Thomas Friedman, consistently provides in-depth reporting on a range of topics that affect us all. 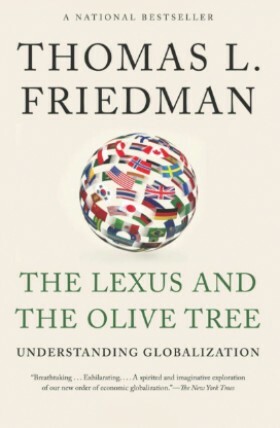 His book, The Lexus and the Olive Tree, provides an interesting look at what the New York Times calls “a brilliant guide for the here and now.” Just as relevant today as it was when it was initially published in 1999, Friedman, a three-time Pulitzer Prize award winner, analyzes the current business world and global marketplace in the newly-revised edition from 2012. Far too often, we narrow our focus to our local area or our own small businesses. When we do this, we miss the broader perspective and the lessons provided to us through changes in information, technology and world finance that only a seasoned reporter like Friedman can provide. Although I do not agree with Friedman in his take on all topics in his book, I find it a refreshing and thought-provoking look at many political and financial issues facing our country. Friedman’s take on the political mindset that embodies our congressional leadership and subsequent challenges that face our country are spot on. He brilliantly points out that when congress behaves “as if the world is now safe for us to be both insular and mindlessly partisan on every issue,” we focus too much time on defining our “common threat and not a new common mission. The big enemy is still the organizing principle for American internationalism and not the big opportunity, let alone the big responsibility.” How we can move forward to ensure the stability and sustainability of globalization is at the heart of this excellent read. You’ll find many ways to challenge your thinking and broaden your scope of what truly affects your orthodontic practice, today and in the future.